(Newser) – Samsung did indeed violate one of Apple's patents in making its Galaxy mobile devices—but Apple violated two of Samsung's patents right back, a South Korean court concluded today. A three-judge panel awarded both companies damages that were a lot lower than what they were asking for, and banned the sale of a number of products from each in the country. But the effect is largely symbolic; said products are all earlier models of current Apple and Samsung offerings, the Wall Street Journal reports. The only people winning in this are the lawyers, not the consumer. 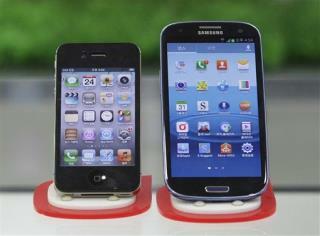 Both Apple and Samsung need to grow up and start working together; get a grip people! meaning: stop bothering courts with your friggin' patent wars. Stupid, all this over 90,000? They probably spent more on lawyer fees during the first consultation and court fees.